• Drink 'Til It's Gone! At the last First Thursday event at the Nevada Museum of Art you guys served a beer that I REALLY enjoyed. Unfortunately, I can't remember it's name. It was supposed to be extra hoppy? I don't believe it's in you're regular lineup. Any idea what it was? I wanted to come in and try some more. That was our infamous Wicked Icky you found yourself sipping on. Come on down and enjoy some more with us while it's still on tap! 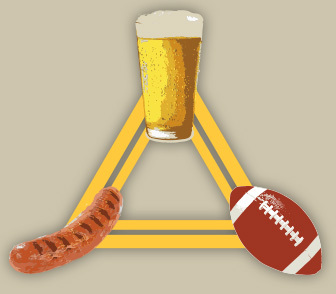 Beer, bratwurst and binge football - the pub trifecta. At both Great Basin locations we'll be serving our Wild Horse Sausage with Cheddar for only $4.95 during the NFL playoffs. With the help of our friends at the Sausage Factory in Carson City, this Nevada-style sausage is made with our Wild Horse Ale and Wisconsin cheddar resulting in the perfect bite during the game. We've just gotten our hands on a selection of rare beers all brewed in Belgium, that won't likely be found anywhere in northern Nevada and are in limited supply now at Great Basin. Get on down here before they're gone. 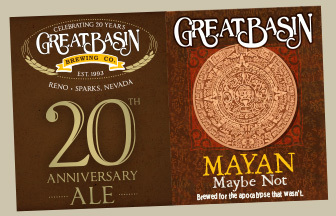 Supplies of Mayan Maybe Not and our 20th Anniversary Ale are dwindling and these limited edition brews won't stick around long. Look for 22oz bombers on store shelves and at both of our breweries and select stores while you still can. Always perfect additions to any beer cellar! We've recently expanded our distribution down Highway 395 into Mono and Inyo Counties of California along the eastern Sierra. 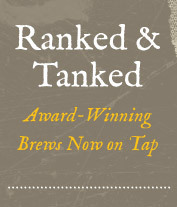 If you don't see Great Basin beer on tap or in the bottle at your favorite beer joint, ask for it! Soon you could be wetting you're whistle on a Basin favorite closer to home. What’s your name and how long have you been at Great Basin? 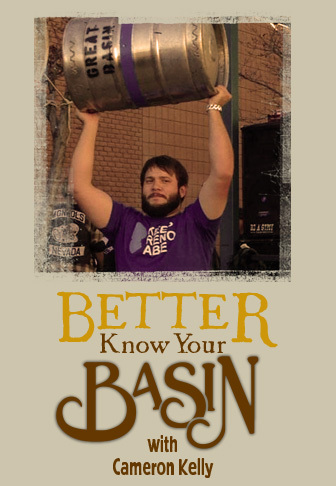 I'm Cameron Kelly and I've been with the Basin for about 3.5 years. I started as a server in Sparks and slowly infiltrated the brewery after 1.5 years. What do you do at Great Basin? I'm the "Brewery Manager - Reno," so mostly I make beer and supervise my giant two-person workforce. Prior to Taps and Tanks receiving their new bottling line and expanding their capacity, I oversaw most of the Icky production for the brewpubs and distribution. In recent months I've been lucky enough to start making some of our flagship beers (Gold, Porter, and Wild Horse) in addition to some fun seasonals (Wicked Icky, Harvest, Wassail, Chilebeso, Little Cowboy Coffee Stout, etc.). Beer is my life and my passion and, to the dismay of many of my friends, almost all I ever want to talk about. I love getting the chance to be creative in the brewery, like when we do our Cask Nights each Thursday. Talking with customers about brewing and the history and concepts behind what we've tried to accomplish behind our brews is one of my favorite parts of my job. Recently we did the Little Cowboy Coffee Stout with our friends at Magpie Coffee Roasters and that was a lot of fun. Basically we took the less concentrated sugars, which would otherwise have gone down the drain, from three batches of Russian Imperial Stout and created a second-runnings beer that was eventually cold-steeped with coffee and served on nitrogen for a creamy-espresso-experience. That particular brew, I came in at 5 am and it ended up being an 18-hour day. It's worth the long hours we put into it when you can share it with people who might have never had a second-runnings, table beer, small beer, or partigyle before. Of course there is a place for traditional everyday-drinking beers like an ESB, Pilsner, or Red - and I thoroughly enjoy drinking those - but, like a lot of our customers, I am adventurous in my drinking and can't wait to try the next new beer we make. My love for craft beer was a slow-starter. The first beer I ever had was a Sierra Nevada Pale Ale and after a few sips I sneaked into the bathroom and dumped it out so my brother's friends wouldn't make fun of me for hating it. After that I swore off beer until some friends of mine took me to the Sparks Basin for Tightwad Tuesdays. It may have been time and maturity that changed my perspective, or it may have just been tasting a fresh and interesting Holiday Wassail, but after those first few Tightwad weeks, it was on. If you were a beer, what beer would you be? I'd love to think I was something everyone enjoys, but I'm going to have to say I'd be a Sour beer. I can come off as harsh and off-putting initially, but once you get used to me you'll find I'm pretty enjoyable.